A two piece suit, the color of Easter. The faint stain of a snapping turtle's kiss. Minnows darting around my ankles. A couple strands of slender weeds. Sky braided into my hair. A soft cover of tannin and cloud. Water stained palms, the color of Earl Grey tea. a minute and a half less from the stretch of grass that was her runway. where the Atlantic was as cold as everyone promised. Wasaga Beach, on Georgian Bay, is my default. Where I go to reset. Star dust sand, so fine, and so, so perfect for castles. The never ending horizon… there is that too. One long seam of sky and sea that ripples when you reach it. There is a sweet comfort in the endless match box cottages littering the shore line and up the many roads leading away from the water's edge. Beach 23 is where all my memories are layered out over loud floral and fluorescent towels, covered in Banana Boat oil and burning under the sun. I find it’s best to move away from the main drag… but occasionally, a trip to the carnival strip is good for the soul. The drama splashed unapologetically across the simple white beach. Sometimes everyone needs the noise to roar. and then slip out past the countless sandbars… till you reach the deep. Our guide to late-summer docktails at Sunnyside Beach – our favourite Toronto landscape and home to one of our fave swimming holes, the Gus Ryder outdoor pool at Sunnyside Pavilion. 1. Cross fingers for gorgeous August sun. When the skies refuse, dig out pants and sweaters and scarves and shake fist at sky. Fill bike basket with rain gear to ensure the rain stays at bay. 2. Dodge dragon-boater-and-police-boat-filled docks and find a spot on the rocks. Rename docktail rocktail. 4. Mix Aperol Spritzes (*see Docktail post) as the sun slips through the heavy clouds. (Protip: mini prosecco bottles make for perfect docktail/rocktail pours, even though first glance at the twist-top under the foil may cause cries of foul play. Don't let this deter you. The prosecco is still awesome). 5. Take snaps of sun through glass. 6. Toast our missing swimmer, Rhya. 7. Marvel at the brilliance of the salty olive. Pretend Lake Ontario is a Venetian canal. 8. 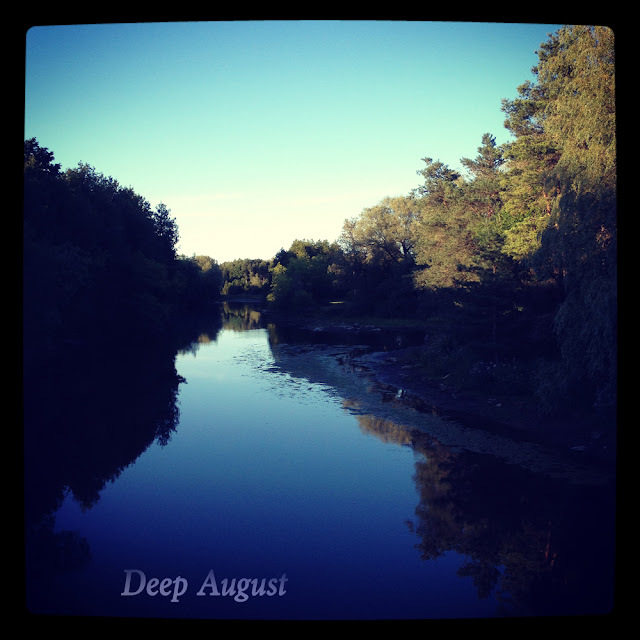 Share stories of healed hearts and swimming holes and reclaimed summers and Portugal dreams and September starts. I love swimming. I love swimming more than almost anything else, but it takes me forever to get in the water. It doesn't matter if it is a walk-in beach, a dock, or a ladder. It doesn't matter if you count me in three-two-one, or if you go first, or if the sun is already setting, it will still take me forever. I will dip my toes in, let the water reach up to my ankles, maybe my knees, and not go any further. I will put my goggles on and splash water on my thighs and still not get in. I will hang off the edge of the dock with my arms bent back like broken wings, and I will still pull myself back out. He didn't know this about me when we sat beside the Gatineau River, our first weekend together. He didn't know, and pushed me in, jumping in after me, laughing. He didn't know, but I was furious and trying not to be furious with the audience of friends still on the dock. He didn't know then how much I hate being thrown in. He didn't know then how long it takes me to get in. It punctuated all my summers when I was small. And the rusted BMXs were sacrificed by the Cooper boys that lives down the east back line. There was also a lonely raft in the center of the pond. 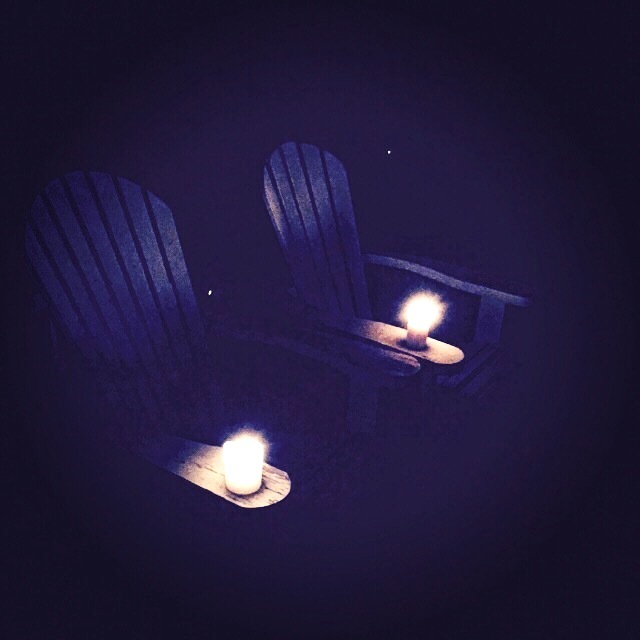 There was just enough space to hold our secret conversations. About someone back on the shore, or probably the life guard. Trapped by aged and rotting wood. Vaulted away for safe keeping. The shallow end is where I learned to float for the first time. Plodding along, dragging the wind behind them. Sound lapping in and out of my ears. There was less seaweed then you would imagine. The pond had a thick sandy bottom bracketing it’s south side. And would occasionally steal the skin from the soles of our feet. You could dive straight into the deep end. I tried it once or twice. But touching the bottom wasn’t for me. Waiting for me to move into their reach. I have been to Harold Quarry three times. The first time was many years ago. Rural Ontario can be ridiculously hot in the height of summer – the year we went was before C had built her pond at the Schoolhouse, and so what we used to do in those days was sleep-in (hot), have breakfast outside (hot), and then hang about getting hotter. Cruise around the garden, play frisbee, read books on Muskoka chairs, play croquet and drink Pimm's. When it got to be too much – the heat – we'd all pile in the car and find a local swimming hole. I remember Harold Quarry as having a HUGE rock cliff wall that people were jumping off. Daredevils, I thought. I would never. I remember the water being packed with people -- families, teenagers, hooters and hollerers. I remember the water being that clear quarry blue, and I remember thinking (having never swam in a quarry before) that it was deep and exciting and colourful. Earlier this summer, I went on a solo roadtrip that took me back to that area of Ontario, and I tried to re-find the Harold Quarry. Step 2: Kick-off Picnic at "The Other Quarry"
When I got to Campbellford on my road trip, I couldn't remember the name of the quarry we'd gone to all those years ago, so I started googling "swimming quarries" in the area. This led me to the Seymour Conservation Area, which has a parking lot, and a hiking trail, and a path to its swimming quarry. WHICH IS AWESOME. When I saw it, I knew it wasn't the one I was looking for because it didn't have the ENORMOUS cliff wall that I remembered, but boy oh boy is this place gorgeous. A mirror for the perfect puffy-cloud-skies that Campbellford country is famous for, and grassy lawns all round that are perfect for your picnic blanket and your best Manet impression. Here's a picture. Nice, right? Highly recommend. Here's where I have done some important research work for you, because amazingly, the Harold Quarry does not come up so willingly on Google searches. And the guy in the pickup truck in the parking lot at Seymour who had lived there all his life had no idea there even WAS another quarry in the area. So here's what you do: drive through Campbellford up the hill to the big church and hang a right where the sign says "TO STIRLING." Follow that road (#8 on a map) all the way till it dumps you off at a stop sign in Stirling. The drive is super pretty. You can get a soft-serve cone at the Empire Cheese Factory on the way, but only if you arrive before 5pm SHARP. You cannot get ice cream after that. It's a surprising fact for city folk, and a real drag I know, but you must accept the ways of Small Town Ontario. At the stop sign, turn left and head into Stirling. You'll pass the Black Dog Family Restaurant. I didn't go there. You'll drive through the cute and tiny town, where they have Jimmy's Special Pizza. I didn't go there either, but it sounds pretty good. At the corner where the Mac's Milk is, you want to turn left and STAY left on the road to Marmora, not Madoc. They are wildly different places. As a bonus, Marmora is awesome when you say it really fast and I recommend this as a fun car activity at this corner. So now you're on the Stirling-Marmora Road, which is #14 on a map, and you'll drive by a charming old red barn that says "Apple Place ahead", followed by the not-so-charming actual Apple Place shortly after. On your right, you will pass a big barn and a farmhouse store called "BUFF STUFF". They sell buffalo mozzarella and other buffalo... stuff. I didn't go there either, despite my caprese salad hobby, but maybe you should just stop in and tell me how it is. Now you have to pay attention, because you're going to get to a road sign that says "HAROLD" and about 500m later in the opposite direction, the other "HAROLD" sign will appear. Harold is very small. Soon after that, on the left side of the road, is the entrance to the parking lot for the Harold Quarry. There's no sign except for the "Abandoned Quarry" sign which isn't highly visible, so you'll probably drive right by it, I did both times. But circle back, and now you're here. The first thing I noted upon my arrival is that the rock cliff wall is not actually enormous like it was in my memory, but I will still admire you if you jump off it. Because I would never. Here's a picture of it with my little Babycar. This was the final swimming hole Babycar ever got to visit on her Roadshow, as she had a little episode shortly after and then went to Smart Car Heaven, RIP. But I digress. There was no one there on that visit to Harold Quarry, and I was cold so I didn't go in. You can walk through the farmer's field at the top and see the quarry from different vantage points. There's no shade to speak of, but there are a couple of nice rock shelves here and there that you can sit and dangle your feet off of. But that's about it. You could probably drink a beer and eat some potato chips out of the bag and be pretty happy. And then you'll get back in your car and that's it. Hooray for Harold Quarry. 1. Andrew Bird's "Echolocations" album from last year was recorded outdoors in a desert canyon and the music weaves in and out of the wind and the water and the birdsong in the canyon. It's mesmerizing and if you feel like a slightly introspective drive through gorgeous countryside, it's a great choice. 2. Really long fun songs are always great car songs. My faves are the Hot 8 Brass Band's version of Marvin Gaye's "Sexual Healing" -- which just might be The Most Fun Version in the History of the World of that song. I first heard it on that movie "Chef" where they were also on a roadtrip. The movie was ok. Another fun movie-version song that goes nicely right after that one is "Try a Little Tenderness" from The Commitments. And then one of my favourite super-long songs is that old Bruce Springsteen song "New York City Serenade". Anyway, that's it. Let me know if you make the trek. Bring me back some buff stuff. I can’t take credit for the name. An old boyfriend in Muskoka coined the term and I have borrowed it ever since. Then again, maybe he didn’t coin it — he was the kind of guy who claimed to have a friend who invented putting the fries in the top half of the Big Mac box too. Hmm. Anyway, Docktail Hour begins anywhere from 3pm on. It depends if you had lunch or not and if you need a mid-afternoon snack to tide you over until late-afternoon snack. So really, anytime you need a snack in the afternoon is pretty much an acceptable time for Docktail Hour. To do Docktail Hour properly, you need to consider the colour of your drink and whether it will look amazing with the sun pouring through your glass. Like awesome enough to make your friends yell “Oh come ON” at their Instagram when you post it. 1. Aperol Spritz (see photo above. This one is a total winner at sunset.) You need Aperol, Prosecco, a splash of soda water, and if you do things CORRECTLY, as they do in Venice, you’ll make it a dirty one with a couple of high quality green olives. This is proper, in my opinion. 2. Rosé. Yes way, rosé. Pink drinks in a glass glass can never go wrong. Plus rosé is extremely refreshing. You need a good crisp dry one though. My favourite local rosé is Malivoire’s Ladybug, but otherwise, the Provençal ones are almost always a sure thing. 3. Pimmers. This is what we fondly call the particular blend of lemonade and Pimm’s with 3 ice cubes that we rock at Shepville, my sister’s cottage on Limerick Lake. This is also an absolute friggin’ delight when frozen in popsicle molds. It is an extremely sneaky way to get your mom tipsy as well, because you can pass it off as an Arnold Palmer, which she thinks is iced tea and lemonade. 4. G&Ts. A classic move. Can’t go wrong. But, given the extra points for colour noted above, you should use Hendrick’s because it goes best with the slice of cucumber that you really should have in your glass. 5. The Kiddo Version. In our family, the Littles require a docktail at the same time as the adults, sometimes sooner. Lemonade base, and then whatever pink or orange soda pop you can convince their mother is ok for them to have a little splash of. Then you have to promise to run around with them to work off their sugar high. Parents are not responsible for this step if you are the one bringing the docktails. 6. Margaritas. High effort because lime squeezing and shaking things in a shaker is involved, but this one probably has the biggest bang for your afternoon bender buck. Docktails are best served with good old salty potato chips, or at fancier swimming holes, a nice board of charcuterie and smelly cheese. I have never swam here, even though I've been coming to its banks since before I could pronounce my Rs. The Humbah -- where legend has it the geese chased my two-year-old self away from the water's edge, hissing, biting. 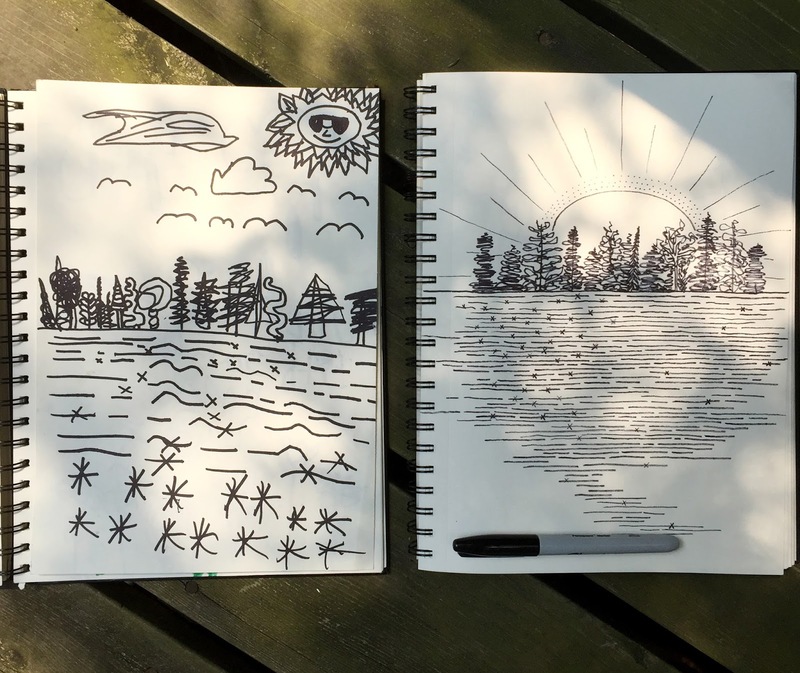 Earlier this summer, I sat in the grass while my baby slept and the Queen Anne's lace grew taller than my waist, and watched a man leave his shoes, his shirt on the shale beach and do front crawl upstream. I was horrified -- doesn't he know how dirty the water is? -- but also jealous. Mostly jealous. I have always wanted to swim in the centre of this river. and the locked up museum that had her left-behind comb and plates from the Titanic. The sign off the highway was easy to miss, but we caught it just in time even though we didn't have bathing suits and we had been told it was a bit of a hike from the parking lot. By the time we reached the water, our fingers were stained with blueberries. The water was shallow and then suddenly not shallow, the waterfall quieter than we both expected. A dad insisted his kid wear a life jacket. A pair of teenagers didn't stay in for long. We slid on the rocks until the sun disappeared behind the trees and had to dry off with T-shirts. We soaked the seats of the rental car, blueberries ferried north in carefully cupped palms. I drove all night in the pitch black to get here. past the field of singing sheep (although tonight they had fierce competition with the crickets). I drove all night in the pitch black to get here, so that when I wake up in the morning, I can jump out of bed, run down the path cut through the field (corn on one side, wild clover on the other), salute the sun, and dive into the Schoolhouse Riviera. The windmill will keep time, and the blackbirds will mind my future. Till then, there are a million stars and a fingernail moon hanging in the sky. 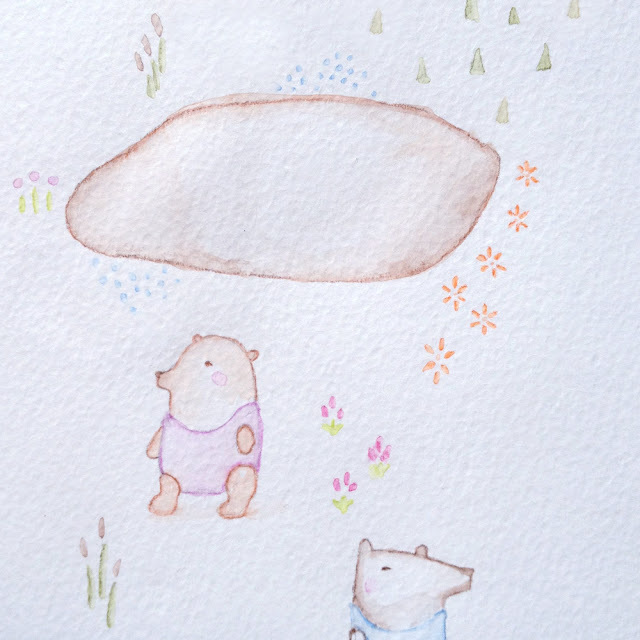 I’ll meet you at Wilder Lake. I drew you a map and left it on your dashboard. The directions are still bobbing softly on the page. to sink into and trace the wavy surface. And rippling in the sunlight. Even though it was my idea to draw the sparkles on the water, I feel like Sammy's is the better drawing because his sun got sunglasses. I didn't do any research before I went, but it turns out Nebraska gets really hot in the summer. Really windy, and really hot. My room was on the third floor of an old house and had one window that opened, and one window that didn't. I have never been so hot in all my life. When Charles or Adele were also too hot from making sculptures and collecting seeds from native plants in the mid-day sun to stand it anymore, we would pile in one of their cars and drive past fields of seed corn and feed corn, across the bridge that spanned a shallow brown river to an old quarry. The beach was long and the water was so deep no one ever dove to the bottom and if you swam to the centre of it, you could see telephone poles and the empty highway. I swam the width of the quarry, back and forth and back and forth, and thought about different types of grief until my arms were too tired to keep going and then I would lie in the too-hot sand and listen to Adele talk about architecture and Japan and the rare snake she and her grandmother found once and kept in the deep freezer. That, or breaststroke to where Charles lay on his back, floating. I had never known a man who could float until I met Charles, lying on his back, eyes closed, as close to asleep as you could be while in water. You have to fill your lungs and find your fulcrum, he said. And I practiced and practiced in that cold Nebraskan quarry. I practiced until I found that hinge, somewhere above my hipbones, and figured out how to keep my lungs three-quarters full. I have never been able to float on my back like that, entirely still and nearly asleep, ever since. 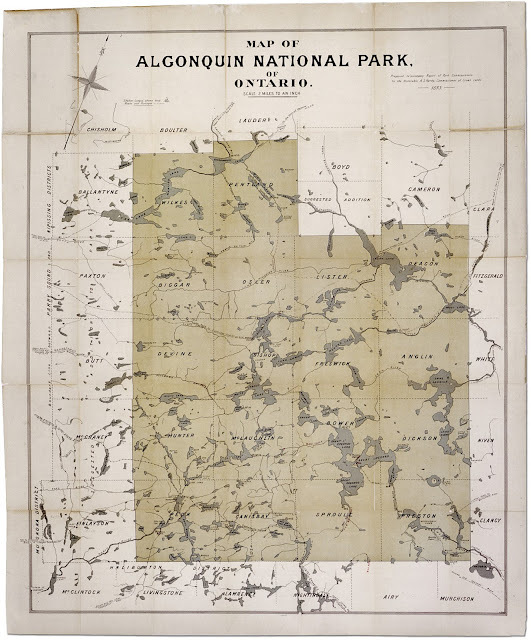 "Map of Algonquin National Park of Ontario" by Department of Crown Lands and Resources Records Archives of Ontario, AO2903. impossible to see from shore. until the leaves started turning. On the shores of Georgian Bay. Sunday, August 9th, mid afternoon. Out past the pebbles that swallow your feet. Out past the slippery stones. There, where the sand starts. Where the horizon is all you have. Where the water holds you close. 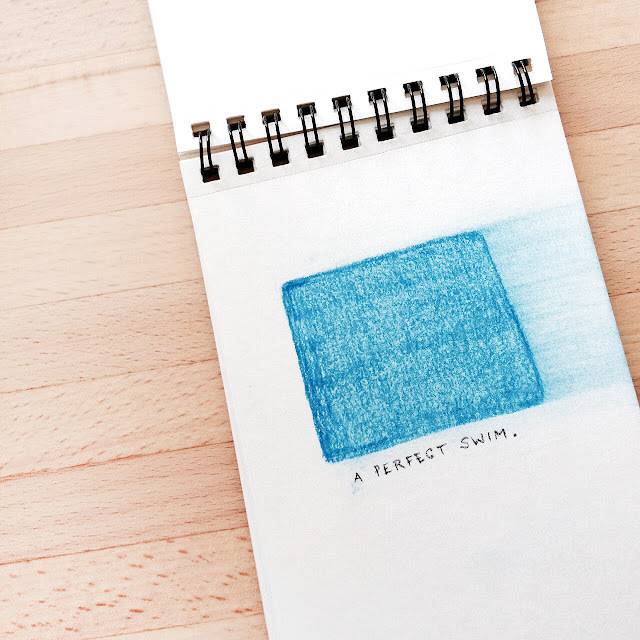 There, is a perfect swim. This is one of my favourite swimming holes in the whole world – not only because it is on the side of a Catskills mountain, not only because 2 of my favourite people host the best docktail hour there, and not only because I was one of the first 3 people to ever swim in it. Mostly it is the accidental typography. T for Thanks, I say. It’s struggle against the weight of night. Skin cracked, caked in gravel. Anchoring me to the river bed. And the sharp bite of the rocky floor. *Based on memories from The Saugeen River in Priceville. 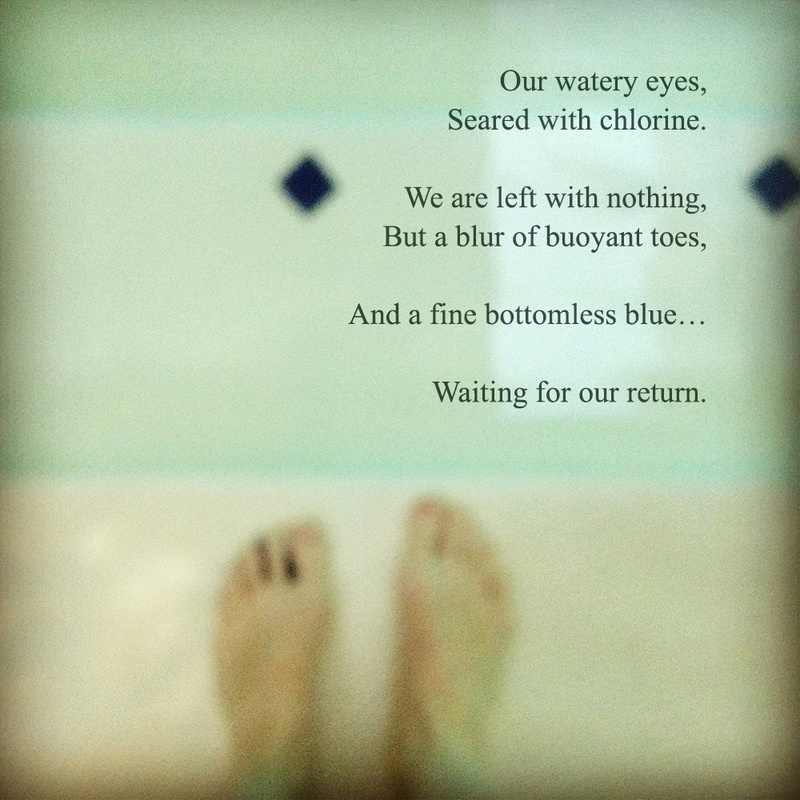 Swimming back and forth along the buoys, I realized my heart was whole again, and had been for a while. This swimming hole has seen its share of heartbreaks. But the bottom is lined with blue clay, known for its healing powers, so somehow, it fixes them. I didn't know how to tread water. I failed my red badge three times in one summer, my hands and legs too frantic to keep me afloat for the requisite minute. But at the cottage I found the sandbar, far enough out from the dock that it looked like it should be deep. I stood on the sand bar and waved my arms across the surface of the water, shouting to my mom to look, look, I was treading water! Dad found me out with his diving mask and snorkel, and both him and Mom were disappointed in me for lying. But it didn't feel like lying when I was standing there, my arms spreading the peanut butter like Jennifer and Rebecca, and Dave taught me to do. It felt like I could finally do it, even if my feet weren't riding an imaginary bicycle. 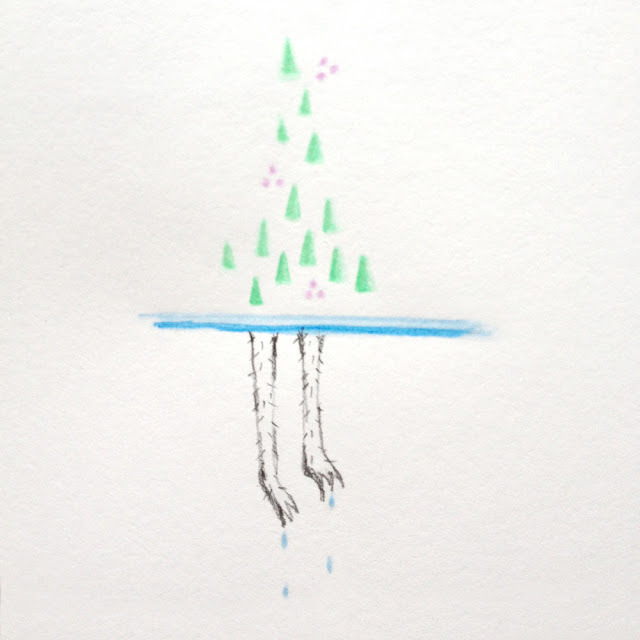 It felt like I could finally keep myself afloat. And this year, the Gatineau River again, but this time from the rocky beach near the poison ivy and the sailing club.